As I indicated in the Assignment 12: Close Up Photography announcement, you do not have to have a macro lens to participate. There are many ways to create close up photographs which does not require expensive equipment. On most Point and Shoot cameras there is a mode setting with the macro icon you see here. Selecting this puts the camera in Macro mode. While it is not a true macro at 1:1 (which means the size of the subject in the photo equals the subject’s size), you will be able to get a much closer image than on any other setting. 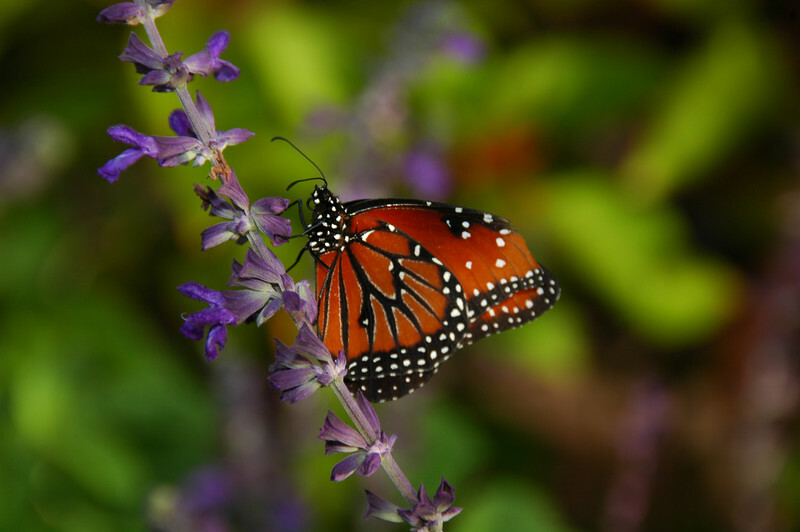 Using any lens on a digital SLR camera, you can get close up photos. I tend to favor my zoom lenses for this task. You need to know your lens’ minimal focusing distance which is the closest distance a lens can focus at. 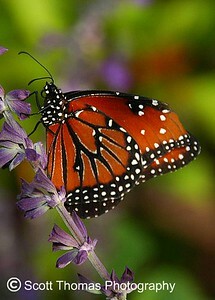 The photo of the butterfly was taken with a Nikon 18-200VR DX lens and then cropped for composition. Click the image to see the original photo. The lens can get as close as 1.6 feet or 0.5 meters and produces very sharp images with excellent bokeh and color. The minimum focusing distance does not change with the focal length and remains 1.6 feet throughout the Nikon 18-200’s focal range. If you have a zoom lens, check to see if it has a Macro setting. While they are not true macros, they do get you down to 1:3 or 1:4 and make very good close up photos. An old technique that’s been around since the days of film (remember film?) SLR cameras is the Reverse Lens Macro. Thereby you reverse the lens so the front of the lens is attached directly to the camera. This creates a magnification effect. 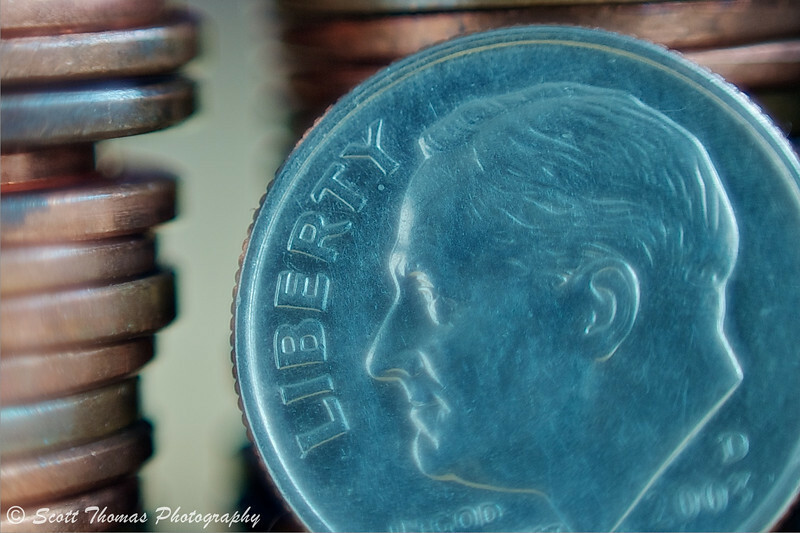 To do this safely, you should purchase a macro reverse ring which cost less than $10US. I will go into more depth on this technique next week and how best to work with it. As the camera can not give you aperture information. Reverse lens macro does create fantastic images which are unique to the world of close up photography and is an inexpensive introduction to macro photography. 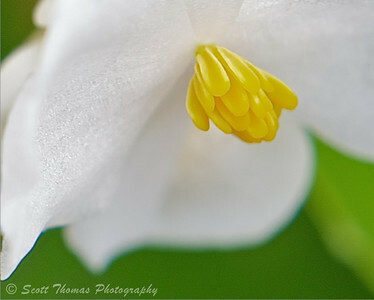 The photo of the white and yellow flower was taken with a 10x Close Up filter attached to a 50mm f/1.8 lens. These close up filter sets cost about $20US. They are not very good and take a lot of post processing to clean up sharpness and color aberration issues. I will be investing in a better close up filter solution in either the Canon 500D Close Up filter (available for all lenses) or a Raynox Macro lens which adapts to many lenses and even some Point and Shoot cameras. Though the last two options cost more. The quality of the filters will make up for the cost with less time processing the images. Unlike the reverse lens macro technique, your camera works as normal while the filters act like a magnifying glass for your lens. 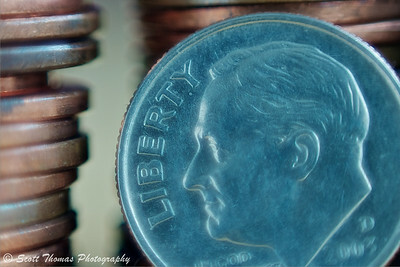 Macro Extension Tubes are another cost effective and fun way to produce near macro images. 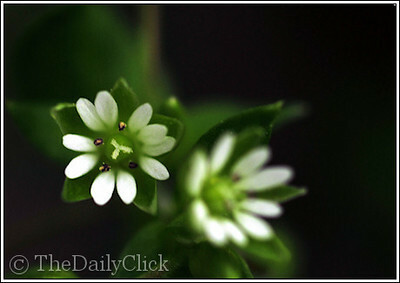 Like the close up filters, your camera works as normal and the extension tubes fit between the camera and the lens. Magnification effect of stacking macro extension tubes. © Karen Davis. While you can get extension tubes separately, most people buy them in sets and use them in various combinations as they can be stacked (see above). Karma (Karen Davis) supplied this set of rose photos to demonstrate the stacking effect of extension tubes. Now we come to the true Macro lenses. These lenses produce true 1:1 macro photos. Prices range from a few hundred to between a thousand and two thousand dollars. The big advantage of using Macro lenses is they work like any other lens you use and the quality of the glass is not compromised by having filters or additional spacers like extension tubes. This produces the sharpest and cleanest way to create macro images. You also have full creative control of depth of field as seen in the photo supplied by The Daily Click (Michaela) taken with a Nikon 60mm Macro lens and Nikon D300 dSLR camera. “She’s so Fly” (Crane Fly, Female). Nikon D300/105mm Macro, 1/80s, f/10, ISO 640, i-TTL built-in Flash and EV -0.7 (Flash). 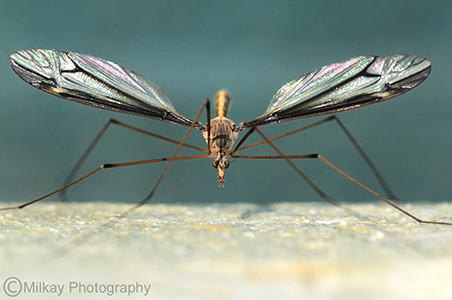 Let’s not forget about the little creatures which share our world as Tracy of Milkay Photography shows us with this head on photo of a female Crane Fly using a Nikon macro lens and flash. Hare are some tips for getting a bargain price for a Macro lens if you are thinking of getting one. Look for used models which are slower (f/4 instead of f/2.8) and manual focus instead of autofocus. Since you most always use a tripod when creating macro photos, there is not much need for the most expensive or newest versions. Or, if you are like me and not sure if you would use a macro lens much, you can rent one to try it out. I am doing that this weekend with a Nikon 105mm f/2.8 VR macro lens from LensRentals.com who I highly recommend. I hope I have helped you find a way to enjoy doing the Close Up Photography assignment. If you have any questions or suggestions, I encourage you to leave a comment. Bryan Peterson has a book called Understanding Close-Up Photography which further goes in-depth into how to create superb close-up photographs. Bryan’s book is filled with photographs which illustrate the methods and tools he expertly writes about in a way that is easily understood. His photographs will further inspire you to create your own beautiful close up photos for less than $20US. This entry was posted in Photography and tagged canon, close up, extension tubes, lens, macro, nikon, raynox, reverse, zeikos. Bookmark the permalink. Very helpful Scott. The images you’ve featured are all quite inspiring. I big THANK YOU and shout out to Karen, Michaela and Tracy for offering to help me by sending me their photos using equipment (and talent) I did not have. You gals are the best! these pics look brilliant, i wish i was this artistic! Thanks Scott, I’ll keep in mind to carry my tripod around. Love the macro shot of Tracy’s image. Aye, I am learning the patience part. The results are well worth it. Example of rubbish close-up photography. I’ll have to remember this is here. Or, you could repost it on the assignment announcement. Either way, this is a neat close up. So glad I stopped by before the weekend started. I’ve got my macro lens all ready to go – let’s hope I find something interesting. I am sure you will, Deanna. I use a Nikon 105mm and its absolute magic. I bought mine second hand at 2/3 the new price – worth looking out for. Something you didn’t mention in your post, is the extremely narrow depth of field associated with macro lenses, as small as a few mm. Consequently when taking a shot its very important where you place your point of focus: foreground, background or middle. I have to agree, I have been shooting with the Nikon 105mm VR Macro all morning in studio conditions this morning. It is magical! Will be taking it on a field trip tomorrow. Thank you for pointing that out, YB. The depth of field is narrow and, unlike other lenses, the area of focus in front of and behind your subject is equal in size. For other lenses it is 1/3 and 2/3rds. Very informative and the images are amazing! Thank you Scott for presenting this, and thank you to you, Karen, Michaela, and Tracy for those wonderful images. Us, guys, think you are well on your way if not already there.